On the 18th January 2016 the creation of the UK’s first proton beam therapy cancer treatment centre took a significant step forward today as work officially began on the site. 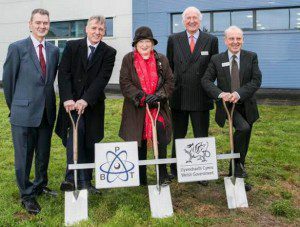 Edwina Hart, the Minister for Economy, Science and Transport for the Welsh Government, visited the site to mark the beginning of the construction of the centre which is expected to be operational by 2017. The centre will be situated at the Celtic Springs Business Park in Newport. Proton Partners also plan to build centres in Northumberland and London and each centre will be able to treat up to 700 patients annually. The investment by Proton Partners International – which is headquartered in Wales – was supported by the Wales Life Science Investment Fund established by the Welsh Government and managed by Arthurian Life Sciences. Edwina Hart said: “This is certainly an important milestone in what is a significant investment by Proton Partners to transform cancer care in the UK. It is also a significant investment in Wales and I am delighted support from our Life Sciences Fund played a key role in establishing the business in Wales and ensured their first international centre of excellence and associated UK training centre is being established in Newport. Mike Moran, Chief Executive of Proton Partners International, said: “Today marks an important step in our plans to improve cancer care in the UK and I am proud that Wales is leading the way. “Our centres will offer proton beam therapy, imaging, radiotherapy and chemotherapy – delivering a fully comprehensive level of cancer care, tailored to fit the different needs of each patient. Later this year in our Newport centre we will be able to start treating patients with traditional radiotherapy, and proton beam therapy will be available in 2017. Across the world proton beam therapy has been shown to deliver significant results for patients, especially in lowering side effects. There are currently no operational proton beam therapy facilities in the UK and the demand for more specialised cancer care is growing. Proton Partners are at the forefront of bringing proton beam therapy to the UK and are working with class-leading providers which will equip the new centres to the highest specifications. To symbolise the links between sport and wellbeing, a sculpture of Olympic double gold medallist Dame Kelly Holmes was unveiled at today’s event and the ITF Wales< Taekwon-Do (International Taekwondo Federation) team were also in attendance.